I have a pi running the latest release of raspbian and it's connected to the Internet using a wireless USB dongle. 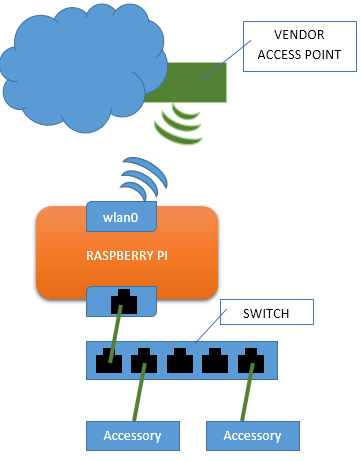 What I would like to do, is to share the pi's wifi connection so that any computer connected to the pi using a LAN cable would be able to receive the Internet. I had a look around the Internet but I can't seem to find anything of relevance. I'm familiar with this process on Windows and Mac OS X, but doing this on the pi has just got me stumped. EDIT: I don't know whether this helps anyone but I am connected to the Internet on my pi via wlan0, but I would like to share that Internet connection via eth0. Next, we will configure dnsmasq. The shipped dnsmasq config file contains a lot of information on how to use it. So, I will advise to move it and create a new one. Remove the # from the beginning of the line containing net.ipv4.ip_forward=1 This will enable packet forwarding on next reboot. But if you want to try it right now without reboot then do this. Above configuration won't work in newer version of Raspbian. So, I have created a script for this which make it possible in less pain. Connect to WiFi network using this guide. Being your purpose provide internet access to your LAN devices, will assume double 'NAT' will not be a big issue. With this configuration you will provide wireless access to non WiFi devices that will benefit from internet access. Make sure your Wi-Fi is properly configured and working. if something goes bad your access to the device through eth0 will be limited or inexistent. edit the file /etc/network/interfaces to match the following, this will set your eth0 a fix ip address (10.10.10.1) and will recreate resolv.conf. # configuration for the bridge internal subnet. Finally, you need to run the script on each reboot, add the following two lines before the exit 0 on the file `/etc/rc.local' to run the script created before. Now, just restart your device and the bridge will be working for you. Not the answer you're looking for? Browse other questions tagged raspbian networking wifi ethernet share or ask your own question.